Imagine having a doctor tell you that, then giving you the real fix. Sounds too good to be true, doesn’t it? But it’s not. Our bodies are just like car engines. Instead of burning gas with oxygen, we burn fat and glucose with oxygen. The result is the same — energy. This is the energy that powers up every single activity of every single cell in your body. Your ability to perform this vital energy creating process is referred to as your “aerobic capacity.” If you operate at optimum aerobic capacity, you are able to reproduce more than ample amounts of energy. But don’t take your aerobic capacity for granted. Just like a car engine can get out of tune and have a significant drop in horsepower, your aerobic capacity can get out of tune as well. When that happens, energy production decreases, and you start to feel like a bike with a flat tire. But it’s worse than that. This decrease in energy production does more than just make you feel and function at a lower level. It’s also the single primary cause of the aging process and all of the diseases of aging. And study after study proves it. In one of the classic papers on the age-associated decline in aerobic capacity, the authors of a new study state this amazing fact, “Maximal aerobic capacity is an independent risk factor for cardiovascular disease, cognitive dysfunction, and all cause mortality.” Simply put, that means that whatever it is you can die of, it’s much more likely to happen if your aerobic capacity is down. And if your aerobic capacity is running at maximum, you are much less likely to die of anything across the board. So when you go into the doctor with your symptom list and he can't find anything wrong with you, ask him to test your aerobic capacity. There's about a 90% chance that you’ll find the answer to your problem there. Unfortunately, very few doctors test the aerobic capacity of their patients. Doctors routinely test cholesterol levels, glucose levels, and blood pressure. And that’s good. These measurements are important. But none of them are “an independent risk factor for cardiovascular disease, cognitive dysfunction, and all cause mortality.” None of them are as important as aerobic capacity. I believe that everyone should have their aerobic capacity checked at least every two years. Keep it at its maximum level, and you will live longer and better. You can get a list of all of the doctors in the country who are routinely testing the aerobic capacity of their patients at www.bioenergytesting.com. There aren’t many yet, but there is probably one close enough to you to make the semi-annual trip worthwhile. If your aerobic capacity is low, there are three easy steps to fixing it. First, start a simple exercise plan that anyone at any age can perform. You can read all about it on my website. Second, do a detox program to get the impurities out of your engine. Again, this is easy to do. The directions are on my website. And, third, make sure your engine has all the nutrients it needs to function optimally. Start by cleaning up your diet and taking QuickStart every day. These three steps can supercharge your engine in no time. 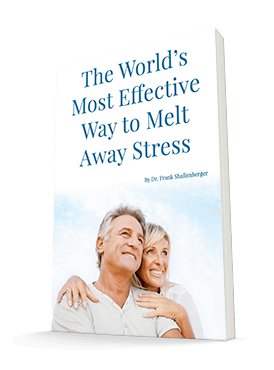 The fatigue, aches and pains, and headaches will be gone. And you’ll have the energy level you had 30 years ago. Wilson TM, Tanaka H, Meta-analysis of the age associated decline in maximal aerobic capacity in men: relation to training status. Am. J.
Physiol. Heart Circ. Physiol. Vol. 278: 829-834, 2000.